There are some amazing electric skateboards out there, but there isn’t anything quite like this one. If you were looking for range, as well as an amazing cruise speed, then we have just what you were looking for. Introducing the Raptor 2 Electric Skateboard by Enertion! Well known for their remarkable electric skateboards, Enertion has done it again, and given us the amazing Raptor 2. All of the parts of the Raptor 2 are replaceable, serviceable and upgradeable. Essentially, the Raptor 2 is completely modular and you can even move the entire drivetrain and battery pack over to a new deck. It also features some incredible technical specifications (pictured right). Essentially, the Raptor 2 pushes the boundaries of technology and innovation to take you further and faster. 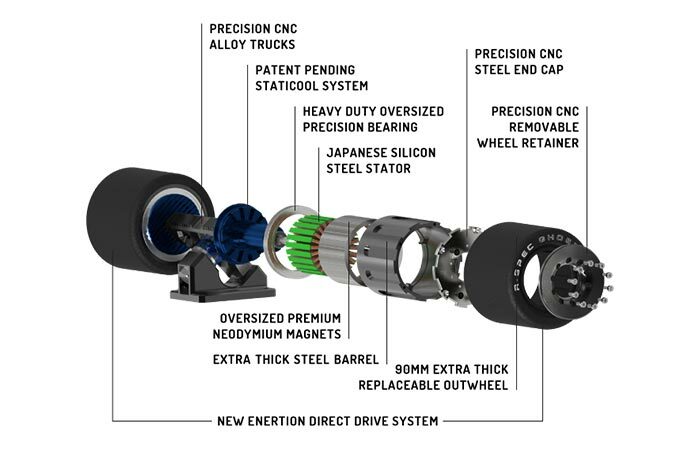 The board features exceptionally powerful direct drive motors that are combined with precision CNC trucks. This gives you spectacular handling and responsiveness at high speeds. Don’t miss out on the videos below. The R-SPEC GHOST in-wheel motor is where all the power comes from. These motors push out 3360 Watts and can have you cruising with speeds of up to 28 miles per hour. It also features Regen braking and a passive cooling system. The Raptor 2 features an incredibly large battery capacity; this gives you a profound range of 25 miles. The R-SPEC GHOST in-wheel motors are also super quiet and powerful. Besides being super quiet, these motors push out an astonishing 3360 Watts of power and can have you cruising at speeds of up to 28 miles per hour. All of this is controlled easily by the NANO-X wireless hand-piece. 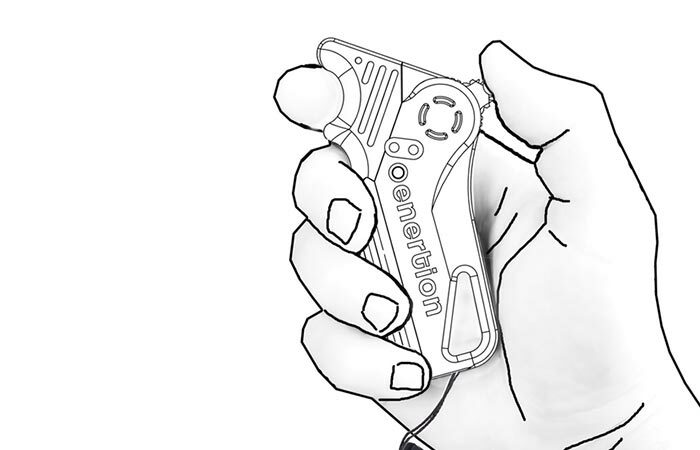 The intuitive NANO-X controller allows you to easily control your entire ride. Furthermore, the board itself is constructed out of a maple and carbon fiber composite. This makes it super strong. All the parts have been CNC machined for optimal quality, durability and performance. The Raptor 2 is also modular; basically, this means that all the parts are removable, easily serviceable, and upgradeable. You can even move the entire system over to a new deck. 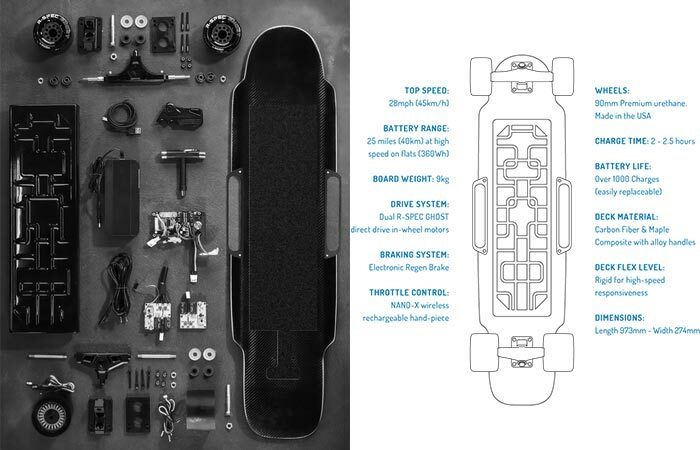 All of this, combined with the open source software, allows you to use the board as you see fit. It also means that you can tweak it to your own needs. The Raptor 2 is currently being funded on Kickstarter, so head over there to save yourself some cash and grab an amazing deal!